Acid reflux is an extremely common health problem, affecting as many as 50 percent of Americans. Other terms used for this condition are gastroesophageal reflux disease (GERD) or peptic ulcer disease. The hallmark symptom of acid reflux is “heartburn”—a burning sensation behind your breastbone that sometimes travels up your throat. In some cases, this pain can be severe enough to be mistaken for a heart attack. Conventionally, acid reflux is thought to be caused by excessive amounts of acid in your stomach, which is why acid-blocking drugs are typically prescribed or recommended. This is a serious medical misconception that adversely affects hundreds of millions of people, as the problem usually results from having too little acid in your stomach. Switching from processed foods to whole foods is therefore step number one. To further optimize your gut health, you’ll want to make sure you’re consuming enough good bacteria from traditionally fermented foods, such as fermented vegetables, or in a probiotic supplement. This will help balance your bowel flora, which can help eliminate Helicobacter bacteria naturally. 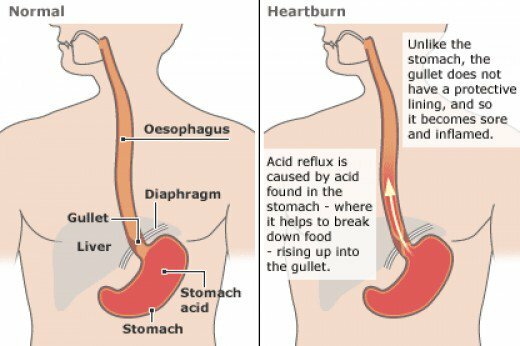 If you have heartburn, acid reflux, gastroesophageal reflux disease (GERD), peptic ulcer disease, or any acid-related condition, the strategies listed above may also offer relief.